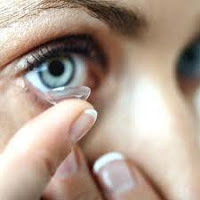 Softlens or contact lenses is one of the medical device intended as a substitute for eyeglasses for patients who have less vision. Softlens made of plastic that contains air.Namun, do you know if softlens it dangerous? On this occasion I will discuss a bit about the Dangers Softlens Or Contact Lenses for Eye Health. From a study, there has been increased eye infection caused by Acanthamoeba Castellani. Infectious diseases are called Acanthamoeba keratitis. Catellani Acanthamoeba is a bacteria that can thrive in water that terkontaminasi.Nah, contamination is common in your softlens storage area. Therefore required to always maintain hygienic and storage softlens softlens you. In addition to bacterial diseases ditimbukan earlier, there are many more dangers caused by softlens. One example is a lot going permanent blindness caused by the use of softlen in the heat. The heat is very easy to make softlens terbat of thin plastic that is melted. When searching, automatic hot liquid plastic that goes softlens kemata and damage eye tissue. Softlens which the melt is also in tight on the eye and glue it extremely difficult to be released. So that people who experience horrible events like this can already be ascertained permanently blind. When using softlens at the computer for a long time, will cause belekan in the eye and the eye gradually becomes blurred. In addition softlens containing water can become dry and then take the water on the surface of the eye so that our eyes become sore and feels dry. This is common in air-conditioned, indoor air heat, exposed to dust, and exposed to cigarette smoke. This can indeed be overcome with a drop of liquid softlens softlens and clean of dust. For those who are susceptible to eye irritation are advised to use softlens not for too long.